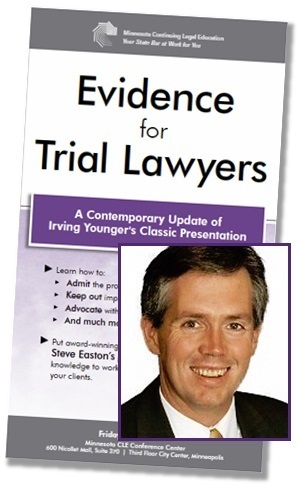 Evidence-for-Trial-Lawyers--Learn-How-to-Win-from-Steve-Easton---and-Irving-Younger - Benchmark Community Evidence for Trial Lawyers: Learn How to Win from Steve Easton - and Irving Younger! Evidence for Trial Lawyers: Learn How to Win from Steve Easton - and Irving Younger! Stephen Easton and Irving Younger show you what to do and how to do it! Learn the rules and techniques you need to get the result you want. Leveraging compelling video footage of Irving Younger’s classic evidence law presentation, award-winning presenter Steve Easton will teach you the evidentiary rules and techniques you need to get the result you want. Steve is a trial lawyer, professor and highly rated speaker. From evidence fundamentals to cutting-edge developments, Steve will deliver commentary, practice pointers and real-world examples that show you what to do and how to do it. Register online or call Minnesota CLE at 651-227-8266 or 800-759-8840. 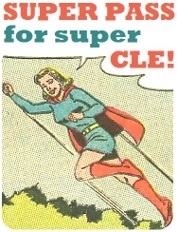 Join the MSBA and pay less for Minnesota CLE seminars! For more information on membership advantages call 1-800-882-6722. Admitted in the past three years? Purchase seminars for half price! View our full seminar schedule and take advantage of the new-lawyer discount. Minnesota State District Court Civil Practice Deskbook, 2nd ed. Minnesota Continuing Legal Education has sent you this e-mail message in the belief that you have established a business relationship with us or have requested CLE information in the past. You may unsubscribe at any time. Please allow 10 days for processing. Ensure deliverability: Add MinnesotaCLE@minncle.org to your address book to ensure receipt of future e-mail messages.